THE RINGMASTER is the 250 pound robot I designed and built for Season 2 of BattleBots >>, a prime time TV show on ABC. 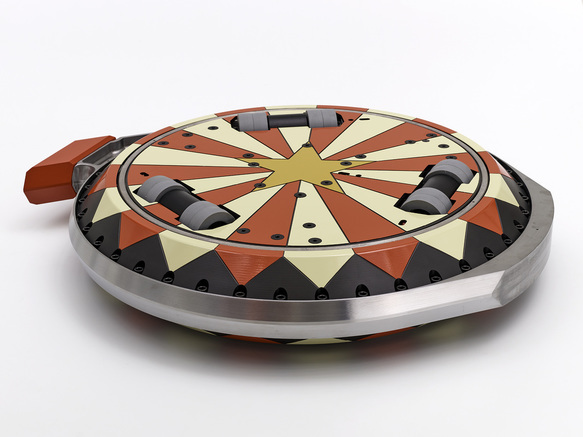 The bot features a steel ring that spins around the center chassis, and a unique vector skid drive system that resists counter-rotating when the weapon hits an opponent. May daughter Hannah drove The Ringmaster during the competition. Spin test before a match. Time laps video of the chassis being fabricated. I made a prototype of the drive system before building the final bot. The first test of one of the three weapon motor assemblies. A test to confirm the weapon's braking system is working.